Construction of the docks, which were planned to serve the Sittingbourne paper making industry and provide a deeper mooring than the silted up Milton Creek, was started in 1913, but stopped due to the outbreak of war in 1914. During the war the dock served as a salvage depot. The dock was completed in 1919, and was operated by the Royal Navy until 1922. The opening of Kemsley Paper Mill in 1923 led to the expansion of the dock, with a link to both the Sittingbourne and Kemsley mills provided by a light railway, now the Sittingbourne & Kemsley Light Railway. The docks received considerable damage in the 1953 flood. Parts of the dock were used by Sheerness Steel Works from 1973 to 2002. 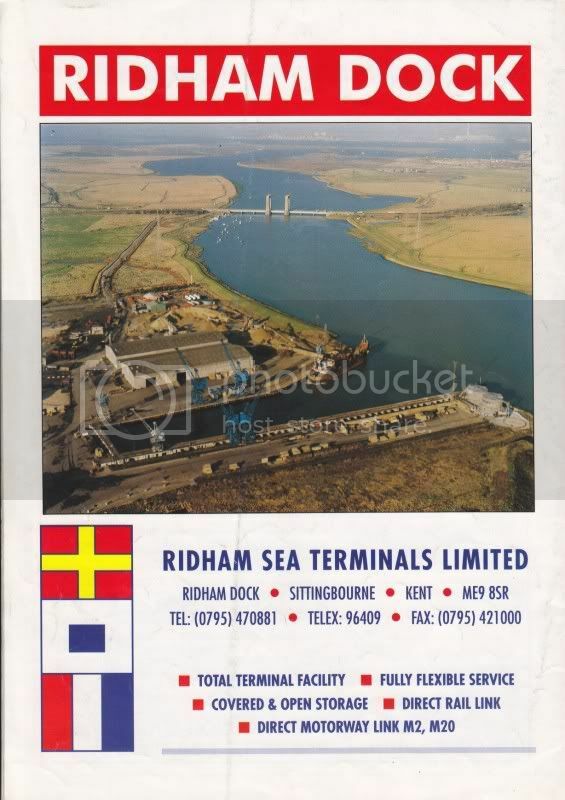 The docks were sold by the paper mills in 1998 and the dock is currently operated by Ridham Sea Terminals Ltd.
4 from May 1930, 5 from July 1936. I think the last ship we did at Ridham must have been about seven or eight years ago. We used to have fairly regular shipments of bulk lead battery scrap (usually 1500 - 2000 tonnes at a time) from Finland and Estonia which were unloaded by grabs onto trucks at Ridham and taken to Britannia Refined Metals lead refinery at Northfleet for recycling. After the scrap was unloaded, the ship's hold had to be washed out and the cleaning water pumped back into road tankers for safe disposal (it contained lead dust and battery acid). Unfortunately Kent County Council busy bodies decided it was too much of an environmental risk moving the battery scrap from Ridham to Northfleet (probably about 20 or 30 miles!) and that was the end of that business! The Ships collided with the Ridham Jetty also. 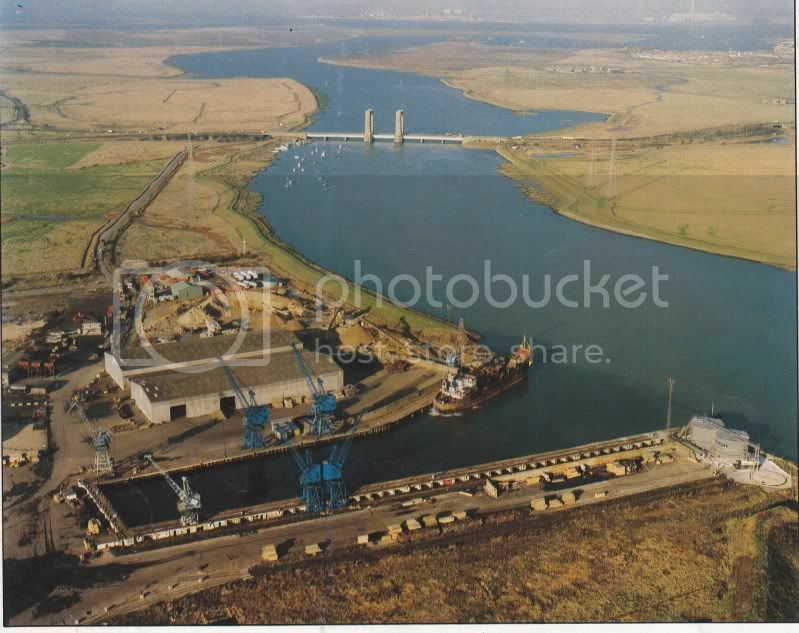 I was contracting in Kemsley Mill just up the road in the 70's and we had the call to go down and repair a perfect wedge hole in one side of the Dock, we were there weeks. And they used to collide with the bridge!! Are you trying to give me a nightmares? I'm only joking. My company used to be port agents for quite a few ships (usually with Russian or Finnish crew) at Ridham Dock. We handled various different cargoes there - timber from Latvia, ammonium nitrate fertiliser, lead battery scrap from Finland and Estonia. We also loaded a ship once with bulk cullet (glass scrap) which went to Ireland. The place was always very run down - big potholes in the road, everything falling apart, hardly any staff. had to lift the bridge. Traffic jam for miles in both directions! We had one Estonian ship which came in with two pilots on board (one head pilot and a trainee) in broad daylight. They managed to sail into the keyside and wrecked one of the fenders - £ 2000 damage. We had another Finnish ship that used to call regularly and the Captain of this ship was most bemused by the fact that the local sheep had black faces.... Obviously not common in Finland! From the "Medports" April 1994.